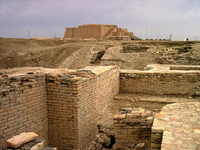 The king-list of the Sumerians gives Eridu as the world’s first city. Eridu (or Eridug or Urudug, from Sumerian Er.i.dug, "House in Faraway Built") was built before The Flood: ‘When kingship from heaven was lowered, the kingship was in Eridu.’ Eridu means ‘Good City’ and it became a temple city. According to Leick, it was built at the meeting point of three ecosystems and supported three lifestyles: farming, nomadic pastoralism and fishing. 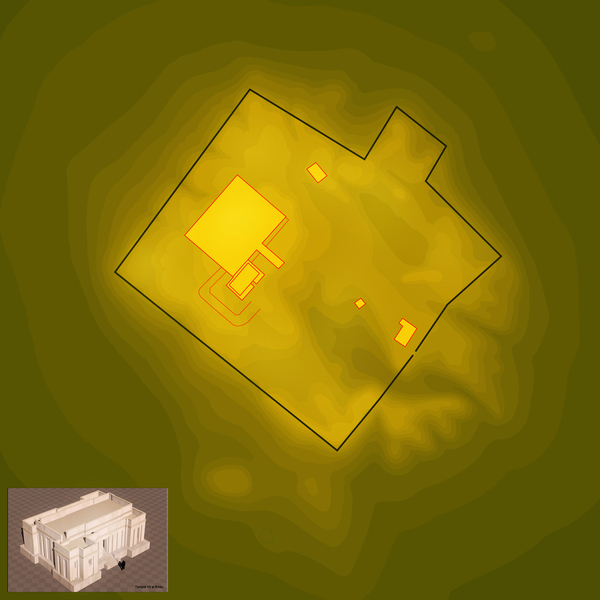 The brick temple complex at Eridu was surrounded by fresh water and therefore by vegetation. In the cosmic geography of Mesopotamia the Earth was an island surrounded by bitter waters, with depths below and ‘On High’ (heaven) supported by great mountains. As a composition of sky, buildings, landform, water and vegetation, Eridu symbolised the creation. Eridu was said to be one of the five cities built before the flood. It appears to be the earliest Sumerian settlement (c4000 BC) near the mouth of the Euphrates River and near the shore of the Persian Gulf. It was a sacred city and had a ‘temple garden’ in the sense of a temple surrounded by water and vegetation. This region is one of the possible locations for the Garden of Eden. Eridu is close to Ur.